Monthony competed for P.E.I. in two of the last three Canada East events, while Binns will make her fourth appearance. Larter, skating in the 13 year group, will make her second Canada East appearance, after a strong season with numerous wins on the Atlantic short track circuit. In addition to their individual events, Binns, Monthony and Larter are expected to team up in the relay event. Kozma will take on a fast field of 14-year-old boys in his second trip to the meet, after setting a new P.E.I. record in the 1500 metre distance earlier this season. Connell and McQuaid are also set to make their second Canada East appearances, skating in the 13 year boys group this season.Team P.E.I. will feature veterans Eliana Monthony and Kristen Binns, both in their final year of eligibility for the event, in the 14-year-old girls category. Also returning to the PEI team are Kyle Connell, Thomas McQuaid, Matt Kozma and Jenna Larter. New to the Island team are Matthew McKenna, Daniel MacKinnon, Andrew Binns, Carter Bruce, Simon Hale and Mia Stewart. McKenna will join his teammate Kozma in the 14 year boys category, while MacKinnon will team with Connell and McQuaid in the 13 year boys category. Andrew Binns, Bruce and Hale will all make their debuts in the 12 year boys category. With six males in the 12/13 age groups, PEI will have the option to field two relay teams in that category and will be looking to McQuaid, Connell and Binns to anchor strong relay showings. Stewart will be the Island’s lone competitor in the 12 year girls division after an excellent season, including a recent gold medal win at a regional competition in Halifax earlier this month. Sarah Taylor will be head coach for P.E.I. squad. Taylor coached the Island’s Canada Games team in 2015 and will be coaching at the Canada East event for the second time. Team PEI’s best ever Canada East finish was garnered by Carly Connell in 2013 with a 5th place showing in the 200 metre sprint. Admission for the public is free of charge. For more information on P.E.I.’s team and the event, visitwww.speedskatepei.ca/canada-east-2016/. Charlottetown, March 22, 2016 – The Eastlink Centre in Charlottetown, P.E.I., will welcome 122 young skaters, March 26-27, for the 2016 Canada East Short Track Championships, presented by Irving Oil. The best skaters from Quebec, Ontario, Nova Scotia, New Brunswick and from the host province, Prince Edward Island, in the “Training to Train” stage of development in the 11, 12, 13, 14 and 15 year old categories will take part in the competition, the final one of the season at the national level. It will be hosted by Speed Skate P.E.I., under the leadership of Speed Skating Canada. The best skaters in Western Canada took part in the 2016 Canada West Short Track Championships in Edmonton, Alberta, last weekend. These championships are intended to be the focal point of athlete preparation for skaters in the “Training to Train” stage of development, while providing meaningful, high profile and developmentally appropriate end of season events which are a source of motivation and opportunity for recognition of the best developing skaters in Canada. It’s also a primary introduction to national competitions where the rising stars represent their province. They will take part in the 200m pursuit event, as well as the 400m, 1500m, 2000m and 3000m points races and 3000m relay events. Competition will be webcasted by Bell Aliant and can be accessed at www.speedskatepei.ca/canada-east-2016/ or www.tv1.bellaliant.ca/. Fans at home can also follow on Twitter, Facebook and Instagram (#CEST2016). Admission is free. 8:05 a.m. – 5:25 p.m.
8:05 a.m. – 5 p.m.
Short Track Speed Skating National Development Team member William Preudhomme, who won a medal in his first-ever World Cup, will be in Charlottetown during the weekend as the honorary ambassador of the 2016 Canada East Short Track Championships, presented by Irving Oil. Preudhomme will take part in the athletes’ banquet on Friday evening, March 25, starting at 6 pm at the Delta Prince Edward’s Palmer-Pope Ballroom (18, Queen Street). Saturday and Sunday, competition days at the Canada East Championships, Preudhomme will attend the competition and meet and inspire the next generation of skaters, as well as take part in the webcasting of the event. Saturday night, Preudhomme will jump on the ice with athletes of the Speed Skate P.E.I. club. William Preudhomme, age 22, won a bronze medal in the 500m at his first-ever World Cup in the 2014-2015 season. He’s since taken part in two other World Cups, while also representing Canada at the 2015 Winter Universiade and at the 2013 World Junior Championships where he won a silver medal in the relay event. At the 2016 Canadian Senior Championships held in January in Montreal, the skater from Toronto won bronze medals in the 1000m and in the 3000m, and finished fifth in the 1500m to take the sixth spot in the overall ranking. More info, including the full schedule and results, are available on Speed Skating Canada’s Website at www.speedskating.ca, and on Speed Skate PEI’s website at http://speedskatepei.ca/canada-east-2016/. Charlottetown, le 22 mars 2016 – Le Centre Eastlink de Charlottetown, Î.-P.-É., accueillera 122 jeunes patineurs de vitesse, les 26 et 27 mars, lors des Championnats canadiens sur courte piste de l’Est 2016, présentés par Irving Oil. Les meilleurs patineurs du stage de développement « S’entraîner à s’entraîner » des provinces du Québec, de l’Ontario, de la Nouvelle-Écosse, du Nouveau-Brunswick, et de la province hôte, de l’Île-du-Prince-Édouard, dans les catégories des 11, 12, 13, 14 et 15 ans prendront part à cette compétition, la dernière de la saison sur la scène nationale, et présentée par Speed Skate P.E.I., sous la supervision de Patinage de vitesse Canada. Les meilleurs patineurs de l’Ouest canadien ont quant à eux pris part aux Championnats nationaux de l’Ouest à Edmonton, en Alberta, la fin de semaine dernière. Ce championnat du programme « S’entraîner à s’entraîner » est un événement de fin de saison significatif, de haut niveau et favorisant le développement des athlètes, tout en représentant une source de motivation et une opportunité de reconnaissance pour les patineurs les mieux développés du Canada. Il sert également de première introduction aux compétitions nationales pour ces jeunes patineurs qui représentent leur province. Ceux-ci participeront aux épreuves de poursuite sur 200m, ainsi que celles sur 400m, 1500m, 2000m et 3000m (courses de points) et de relais sur 3000m. Les courses seront webdiffusées par Bell Aliant et disponibles et sont disponibles par le biais du www.speedskatepei.ca/canada-east-2016/ ou www.tv1.bellaliant.ca/. Les amateurs à la maison pourront également suivre les compétitions sur Twitter, Facebook et Instagram (#CEST2016). L’admission est gratuite. Le membre de l’équipe nationale de développement en patinage de vitesse sur courte piste William Preudhomme, qui a remporté une médaille à sa première Coupe du monde en carrière, sera à Charlottetown, Î.-P.-É., du 25 au 27 mars 2016, alors qu’il agira à titre d’ambassadeur lors des Championnats canadiens sur courte piste de l’Est 2016. William Preudhomme participera notamment au banquet des athlètes lors de la soirée du vendredi 24 mars, à compter de 18 h dans la salle Palmer-Pope du Delta Prince Edward (18, rue Queen). Samedi et dimanche, journées des Championnats canadiens de l’Est, le patineur de 22 ans assistera aux compétitions et rencontrera et inspirera la relève de demain, en plus de participer à la webdiffusion de l’événement. Le samedi soir, Preudhomme sautera également sur la glace en compagnie des membres du club Speed Skate P.E.I. William Preudhomme, âgé de 22 ans, a remporté une médaille de bronze au 500m lors de sa toute première Coupe du monde en carrière lors de la saison 2014-2015. Il a par la suite participé à deux autres Coupes du monde, en plus de représenter le pays aux Universiades d’hiver 2015 et aux Championnats mondiaux juniors en 2013 où il a mérité l’argent au relais. Aux récents Championnats canadiens seniors présentés en janvier à Montréal, le patineur de Toronto a remporté le bronze au 1000m et au 3000m, en plus de terminer au cinquième rang au 1500m pour finalement prendre la sixième position au classement général. Des détails supplémentaires, incluant l’horaire complet et les résultats, sont disponibles sur le site Internet de Patinage de vitesse Canada au www.patinagedevitesse.ca et sur celui de Speed Skate P.E.I. au http://speedskatepei.ca/canada-east-2016/. February 22, 2016, Charlottetown – Speed Skate PEI has unveiled Irving Oil as presenting sponsor for the Canada East Short Track Speed Skating Championships being held in Charlottetown next month. The Speed Skating Canada championship event will bring the top 11 to 15 year-old short track speed skaters from Ontario, Quebec, the Atlantic Provinces and Nunavut to the Eastlink Centre on March 26 and 27, 2016. The event will feature 128 athletes in the highest level of speed skating competition held in P.E.I. since 1997, when the Canadian Age Class Short Track Championships were hosted in Charlottetown. The competition will include many of Canada’s top athletes of the future. Past competitors from the event have gone on to become part of Speed Skating Canada’s national teams and represented Canada at junior and senior World Cups and World Championships. The Canada East and Canada West short track championships are intended to be the focal point for athlete preparation for speed skaters in the Training to Train stage of development. The events provide meaningful, high profile and developmentally appropriate end of season events that are a source of motivation and opportunity for recognition of the best developing skaters in Canada. These events serve as the primary introduction to national competitions where skaters represent their province or territory in competition. Skaters compete in single year, gender specific divisions of 16 skaters each. Girls from ages 11 to 14 and boys from ages 12 to 15 are eligible to compete. Each participating branch (Province or Territory) is eligible to send a minimum of two skaters to compete in each division. Irving Oil is a privately owned regional energy and marketing company that provides Eastern Canada and New England with high-quality products and customer service. Founded in 1924 and based in Saint John, New Brunswick, Irving Oil maintains a strong tradition of committed community service and partnerships through programs in healthcare, environment, education and youth sports. For more information about Irving Oil and its community programs, please visit us at www.irvingoil.com or follow us on Facebook at facebook.com/irvingoil. 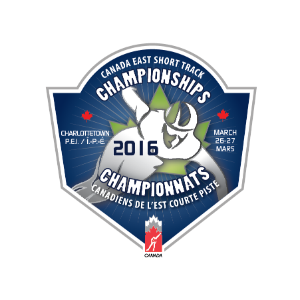 Competitions to be held March 25-27 at the Eastlink Centre in Charlottetown, P.E.I. Charlottetown, February 29, 2016 – Short Track Speed Skating National Development Team member William Preudhomme, who won a medal in his first-ever World Cup, will be in Charlottetown, P.E.I., March 25-27, 2016, as the honorary ambassador of the Canada East Short Track Championships presented by Irving Oil. William Preudhomme will take part in the athletes’ banquet on Friday evening, March 25. Saturday and Sunday, competition days at the Canada East Championships, Preudhomme will attend the competition and meet and inspire the next generation of skaters, as well as take part in the webcasting of the event. Saturday night, Preudhomme will jump on the ice with athletes of the Speed Skate P.E.I. club. The Canada East Short Track Championships, presented by Irving Oil, will showcase the best skaters from Quebec, Ontario, Nova Scotia, New Brunswick, Nunavut, Newfoundland-and-Labrador and host province, Prince Edward Island, in the “Training to Train” stage of development in the 11, 12, 13, 14 and 15 year old categories. This is the final competition of the season on the national level. Last year, more than 110 young skaters took part in this competition held in Fredericton, New Brunswick. More information is available at Speed Skating Canada’s website at www.speedskating.ca or Speed Skate P.E.I.’s website at www.speedskatepei.com. Les compétitions se dérouleront les 26 et 27 mars au Centre Eastlink à Charlottetown, Î.-P.-É. Charlottetown, le 29 février 2016 – Le membre de l’équipe nationale de développement en patinage de vitesse sur courte piste William Preudhomme, qui a remporté une médaille à sa première Coupe du monde en carrière, sera à Charlottetown, Î.-P.-É., du 25 au 27 mars 2016, alors qu’il agira à titre d’ambassadeur lors des Championnats canadiens sur courte piste de l’Est, présentés par Irving Oil. William Preudhomme participera notamment au banquet des athlètes lors de la soirée du vendredi 24 mars. Samedi et dimanche, journées des Championnats canadiens de l’Est, le patineur de 22 ans assistera aux compétitions et rencontrera et inspirera la relève de demain, en plus de participer à la webdiffusion de l’événement. Le samedi soir, Preudhomme sautera également sur la glace en compagnie des membres du club Speed Skate P.E.I. Les Championnats canadiens sur courte piste de l’Est présentent les meilleurs patineurs du stage de développement « S’entraîner à s’entraîner » des provinces du Québec, de l’Ontario, de la Nouvelle-Écosse, du Nouveau-Brunswick, du Nunavut, de Terre-Neuve-et-Labrador et de la province hôte, de l’Île-du-Prince-Édouard, dans les catégories des 11, 12, 13, 14 et 15 ans. Il s’agit de la dernière de la saison sur la scène nationale. L’an dernier, plus de 110 jeunes patineurs avaient pris part à la compétition présentée à Fredericton, au Nouveau-Brunswick. July 24, 2015, Charlottetown – Speed Skate PEI and the City of Charlottetown (SCORE!) announced today that Speed Skate PEI has won the rights to host Speed Skating Canada’s 2016 Canada East Short Track Championships in Charlottetown. The event will bring the top 11 to 15 year-old short track speed skaters from Ontario, Quebec, the Atlantic Provinces and Nunavut to the Eastlink Centre on March 26 and 27, 2016. Charlottetown Mayor Clifford Lee said that the City and its partners are excited to welcome Speed Skating Canada and the young athletes to Charlottetown. The Canada East event, which will feature 128 competitors, will see the highest level of speed skating competition held in P.E.I. since 1997, when the Canadian Age Class Short Track Championships were hosted in the capital city. “Canada East is an important event for us as we work to develop the world’s best speed skaters,” said Speed Skating Canada CEO Ian Moss. “Past competitors have gone on to become part of our national team and represented Canada at junior and senior World Cups and World Championships. Canada East is where we often get a first look at our future elite athletes and we’re excited about doing that in Charlottetown next year,” continued Moss. P.E.I. has sent teams to Canada East for the past four years, with Carly Connell nabbing the Island’s best ever finish, a 5th place result in 2013. Miriam Burnett had a trio of seventh place finishes for P.E.I. at this year’s competition. The Canada East and Canada West short track championships are intended to be the focal point for athlete preparation for skaters in the Training to Train stage of development. The events provide meaningful, high profile and developmentally appropriate end of season events which are a source of motivation and opportunity for recognition of the best developing skaters in Canada. These events serve as the primary introduction to national competitions where skaters represent their province or territory in competition.